Happy Monday everyone!! And I hope I'm starting your week off right with this unbelievable giveaway from The Guise Archives! You've seen me wear my Molly (graciously gifted) from the Guise by Benjamin collection every single day with every outfit for the last three weeks. And rightfully so because they are freakin amazing. They're the perfect cat eyes with a touch of femininity, retro, sophistication, and coolness all in one. And obviously a big dash of versatility. 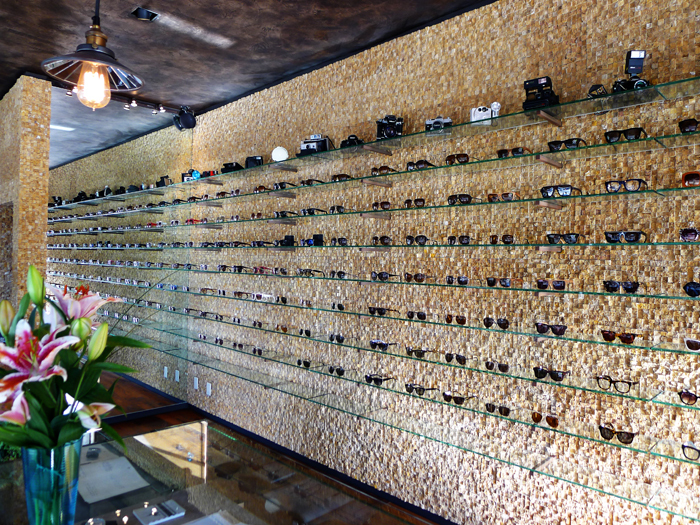 I was honored to have had the opportunity to meet with one of the brand's partners and have my very own tour of their eyewear shop located on the famously rad blocks of Melrose Ave (check out my super fun hang out here). It is alllll about attention to detail in The Guise Archives. 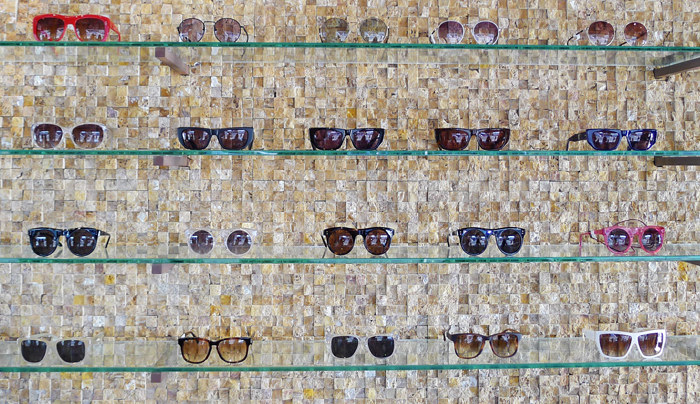 It's apparent in their vintage and unique eyewear curations, their own Guise designs, and especially the store's design itself. Makes it 10x more fun and inspiring to shop in. OK so you all know that if I LOVE something, I can rave about it for paragraphs and pages. 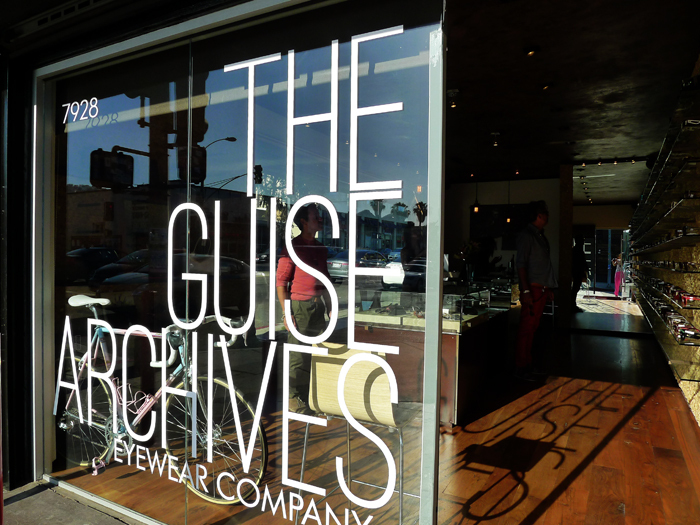 I'll really save all the words and reading and try to sum this up in one sentence: if you're looking for timeless eyewear or sunglasses that no one else has, go to The Guise Archives. Peek these glamorous vintage Celines I found there. Would you really find these anywhere else? Probably not because the people at Guise search HIGH and low for amazing vintage and rare pieces. And as you can see from their very own Benjamin Eyewear designs, Benjamin Montoya is a true eyewear artist who knows how to create understated, elegant, and timeless eyepieces. I'm literally overwhelmed right now with the perfection that's going on with Benjamin Montoya's collections and the Guise Archives that I. just. can't. 3. 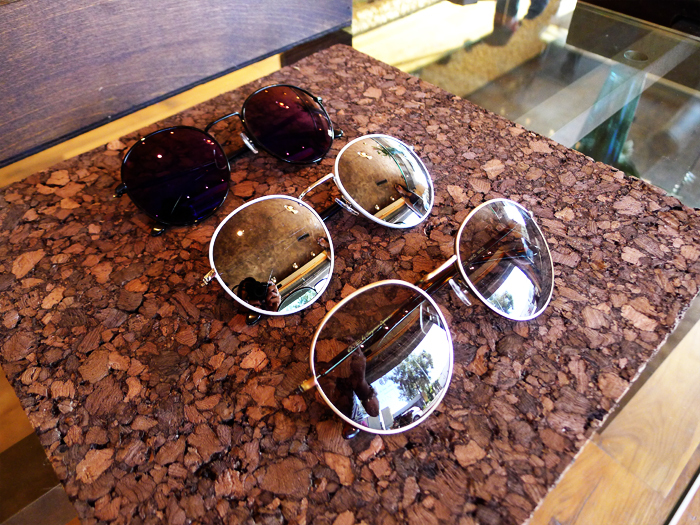 Choose your favorite sunglasses from Guise by Benjamin collection and leave a comment with your name and email. A winner will be randomly chose on July 11th. GOOD LUCK to everyone and thank you for entering!! P.S. if you're in LA, you MUST stop by The Guise Archives on 7928 Melrose Ave. You'll leave inspired and obsessed. And maybe even with a pair of fresh sunnies. P.P.S. Check out Benjamin's very recent and very awesome collaboration with Wildfox Couture! You can see and feel the new collection in store. wow this is an amazing giveaway! i've done steps 1-3. my favourite sunglasses in the collection are molly. i love the shape, they are so elegant. Check out my blog too, http://phoenixful.blogspot.com ; I LOVE YOURS! Hi Janet! Those Wildfox Juliets ARE amazing :) For this giveaway you do have to pick one pair from the Guise by Benjamin collection: Milton, Molly, Stein, or Marlo :) I think you'll LOVE the Molly like the one I'm wearing, since you like the retro wayfarer style. 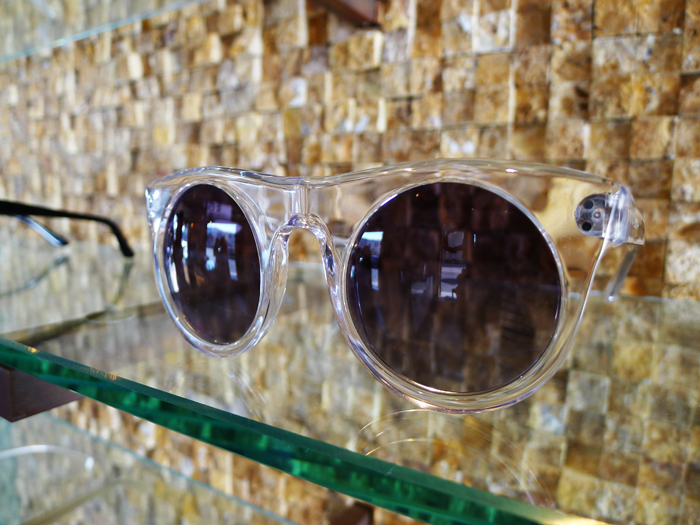 If wayfarers look good on you, these cat eyes will look great! love the gold milton mirror! i love the round gold miltons! ... sorry if this comment doubles but I can't see where the old one went!! It's the Marlo for me! In basic black. My pick would be Guise by Benjamin Eyewear/Molly because they are simply so pretty! Hello! I was already following you on everywhere (GFC, Bloglovin,Twitter and Facebook) and I've liked and followed Guise Archives too. You are on a giveaway kick and I love it! lol! I followed them on FB & Twitter and I'm following you on Facebook, Twitter, and on GFC. I'm obsessed with the Molly shades that you have! Need them in my life. I like Nicole black mirror Benjamin Eyewear. Really love this giveaway. Done all three steps. Hope I win. Thanks. Enjoy it all. What a fabulous giveaway! Count me in for sure! I liked Guise on FB and follow them on Twitter. I also follow you on Twitter & GFC and like your FB page. After seeing how phenomenal the Molly is on you... I would have to say those are my favorites! Oh shoot! Forgot to leave my email address: myhereandnowlife@gmail.com! This give away is fab! I loved all the styles but the Molly is superb, in Crystal especially! I follow you on Twitter and Facebook and the same for The Guise Archives. Thank you so much, this is such a great giveaway. Great giveaway! I liked The Guise on Facebook, and like Honey & Silk on Facebook and google connect! Also my fav sunglasses are the "Molly"
Plus I broke my shades this weekend and need a replacement! Hook it up Honey & Silk! Did all the entries and the additional ones! Awesome giveaway. I love your blog and I'm so glad I saw this post. As a vintage fashion lover, I am obsessed with the Molly Sunnies. I have entered the drawing by following Guise Archives on Facebook and Twitter. I have also followed you on Twitter and Google Friend Connect and liked your Facebook page. Hopefully July 10th ends up being my lucky day! My contact info is below. C910 Bespeckled by Colors are definitely my favorite! The frames are definitely my favorite style to get, and I just love the colors. I'm also in the LA area, so I'll try and stop by one of these days! Did step 1-3 and I liked Honey&Silk on facebook. 1. I like Guise Archives on Facebook: Cindy A. 1. I like Honey & Silk on Facebook: Cindy A.
I LOVE the Benjamin Eyewear/Harmony pair in cream or black! I follow Honey & Silk on Twitter, too! Hi! I love the eye wear by Guise it's gorgeous. I absolutly fell in love with your blog as well as the silver Milton eye wear by Bejamin http://www.guiseshop.com/collections/guise-by-benjamin/products/guise-by-benjamin-eyewear-milton-antique-gold. I also followed Guise on facebook (Kaya R.) and twitter (lipstickbabe21). Your blog is truly inspiring and Im not just saying it to sweet talk. It truly does inspire my sister and I to get out and start blogging. I too LOVE the Mollys! Thanks so much for the giveaway Stephanie :)) I followed the Guise Archives on Facebook and twitter. My favorite Guise by Benjamin collection is deff Molly It looks really feminine and hipter haha im in love with it and im dying to get it!!! I also followed you on Facebook, twitter, and google friend connect for additional entries. I follow you on instagram too btw, haha thanks for cool pictures and this giveaway! I follow you guys on twitter and liked you guys on facebook! Can't get enough of this site and store! I love it! I love the Molly's! ADORABLE! My favorites: The molly glasses in tortoise...oh, my. My big Omission: I'm 33 years old and have never been inspired to enter a contest in my life. (Cudos, these glasses have done it!) Given a chance I would do these beauties so proud, no one would believe it.... Thank you. My favourite pair are the http://www.guiseshop.com/collections/benjamin-eyewear/products/benjamin-eyewear-william-black , the tokyo tortoise colour! I liked guise archive on facebook AND twitter! I followed everything. Well, I was actually already following all of the bonus entry things, but you know. I like the Stein / Guise by Benjamin in Crystal. I can be contacted at ermkcontact@gmail.com. my fav is milton ! Thanks so much for this amazing giveaway Stephanie! I need those sunglasses...they're too cute! My favorite would definitely have to be the Molly. Simple, classy, and super chic. Your pair looks great on you! I made sure to like Guise Archives on Facebook as Alice Lin and I'm following them on Twitter as @theace_ofhearts. Additionally, I also already liked your Facebook page as Alice Lin, follow you on Twitter as @theace_ofhearts, and follow you on GFC as A. 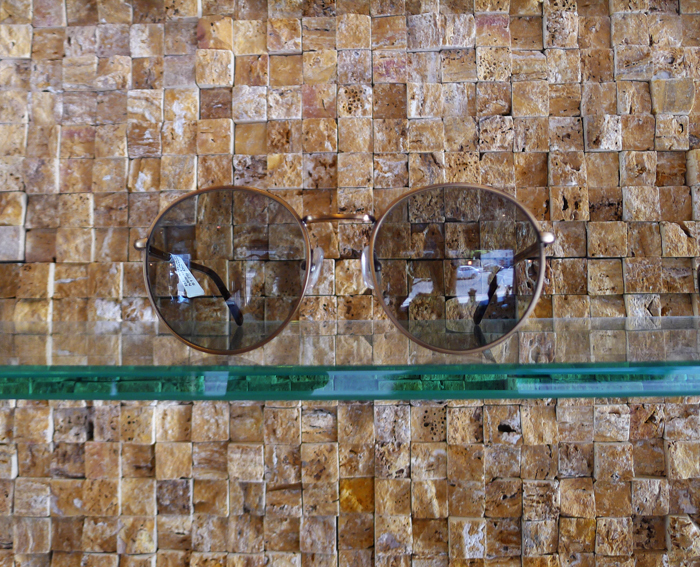 My favorite sunglasses from Guise by Benjamin collection are the Milton. Love their sunglasses. Very chic! Following guise on FB and twitter. My favorites are the steins! Liked honey and silk on facebook. 3. I Like Mod. "003"
I like 'molly' the best. I liked BOTH of the facebook pages. My favorite pair would be the Benjamin Eyewear/ Brotherton. Love the Stein glasses--so big and beautiful! love the black molly from the benjamin collection!! I'm in looooooce with the clear Marlo sunnies! I'd choose the Molly sunglasses! 3. My favorite glasses are the Molly! i liked Guise Archives on facebook and followed on twitter! i like the glasses Molly. liked honey and silk on facebook! followed honey and silk on twitter!! liked and followed you on facebook and twitter! I did steps 1-3 and love the Guise by Benjamin Molly glasses! So cute! I like Honey & Silk on fb! --------------- I just liked Guise Archives on FB under: Nicole O. --------------- My fave is Molly in Tortoise. --------------- I'm a current FB fan of yours under: Nicole O.
i like Guise Archives on Facebook, i follow Guise Archives on Twitter, and i love the molly! i like Honey & Silk on Facebook! i follow Honey & Silk on Twitter! i follow Honey & Silk on Google Friend Connect! 3. i honestly fell in love with the "Molly"s' didnt hurt that you made them look beyond appealing. i would love to be the random winner, tiny faces like mine dont get the luxury of finding glasses that suit them very often, feel these are IT. Hi Stephanie, awesome giveaway! Done 1-3 and additional 1-3. Loving the Molly's in turquoise! Thanks for sharing and good luck to everyone! I follow The Guise Archives on fb as Dee Gol and on twitter @deegee13. I would probably choose the Tart FDR Black -- love these! I like you on fb as Dee Gol. 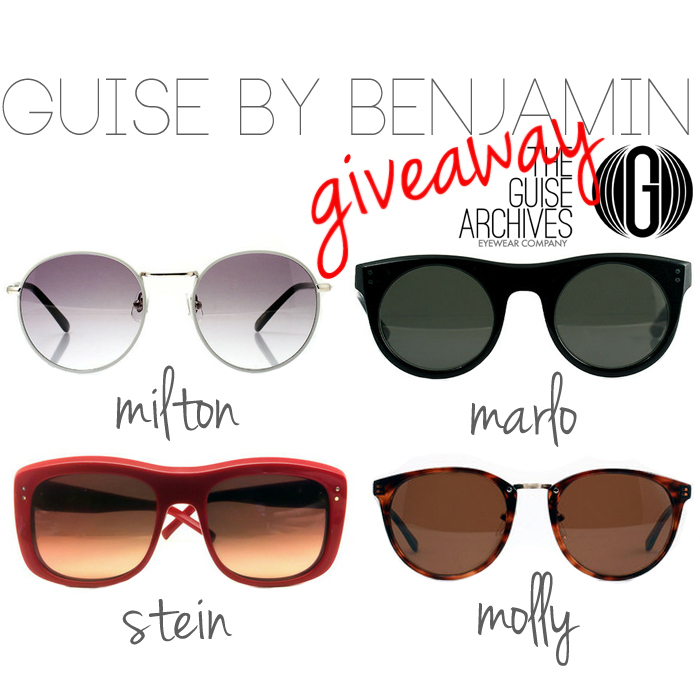 I like the Guise Archives on Facebook as Christy Ann, on Twitter as @babybraddy, and I would love to win the Molly Sunglasses in Black! The Stein sunglasses are my favorite. Also, I liked Honey & Silk on facebook and twitter too.